Punnai Nallur Mariamman temple is a Hindu temple located at Thanjavur in the state of Tamil Nadu, India. The temple of goddess Mariamman is one of the famous temples around Thanjavur District. 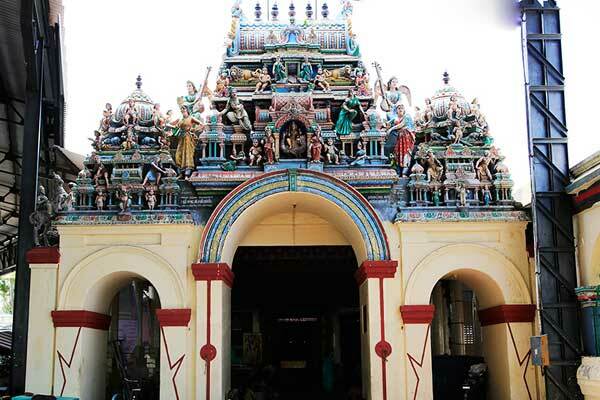 There is an important temple at Punnai nallur, 6 miles from Tanjore, dedicated to Mariamman. The Sthala- Puranam states that, before waging a war with the demon Tanja of Tanjore, Lore Siva stationed the Ashta Saktis (eight powers) one at each of the eight directions, and the one stationed at the eastern direction is now the presiding deity of this temple. Goddess Mariamman, a manifestation of Shakti, was worshipped here in the form of an anthill for a long time. It was only in the 18th century that a temple was built here. The seven-tiered gopuram came up recently. It is still maintained by the descendants of the royal family of Thanjavur. The goddess is also called Muthu Mariamman because drops of moisture, like pearls (Tamil: pearls - Muthu) appear on the face and head of the granite statue from time to time. Once Lord Shiva had to wage a battle against a demon called Tanjan Asuran. The story goes that before waging the war, Shiva installed one of the Ashta Shaktis (eight goddesses) in each of the eight directions. It is said that the Shakti installed in the eastern direction is now called Punnainallur Mariamman. The Maratha King Venkoji Maharaja Chatrapathi was a devotee of Mariamman. He decided to go on a pilgrimage to Tiruchirapalli to visit the other powerful village goddess called Samayapuram Mariamman. On his way he rested under the shade of a tree. Suddenly in his dream Mariamman showed up and told him that she could be found in a forest of Punnai trees about three miles from Thanjavur. The King rushed to that spot and he saw a Puttru or a white anthill. Over this anthill he built the Punnainallur Mariamman Temple’s present structure. The Maratha rulers Thulaja and Serfoji also worshiped here and renovated the temple during their rule. It is said that the daughter of Tulaja Raja (1729-35) of Thanjavur lost her eyesight in an illness and regained it after offering worship at this temple. The Mariamman Temple is still maintained by the descendants of the royal family of Thanjavur. In the year 1680, when the Maharashtra king Venkoji Maharaja Chatrapatti (1676–1688) of Tanjore was on a pilgrimage at Samayapuram, where there is a famous temple dedicated to Kali, Mariamman appeared to the King in his dream and told him -that she (the idol) was in a forest of Punnai trees at a distance of about 3 miles from Tanjore. The King lost no time in rushing to the spot indicated to him and recovered the idol from the jungle. A temple was constructed at the place and the idol installed and so the deity of this temple is known as Punnainallur Mariamman. It is said that the daughter of Tulaja Raja (1729–35) of Tanjore, who lost her eyesight in an illness, regained it on offering worship at this temple. Originally the Amman was in the form of white-ant hill (Puttru). The Great saint Sadhasiva Brahmendra swamy shaped the white-ant hill (Puttru) into a form of Mariamman and also installed a powerful Chakra. The kings who ruled Tanjore took great interest in the development of the temple and they vied with one another in constructing gopurams, mandapams, entrances etc., to the temple. There is a holy tank and the 'floating festival' takes place every year in the month' of Purattasi September-October). Brahmotsavam takes place in the months of Adi-Avani (August-September). Sundays are considered to be the most auspicious days for worshipping the Goddess, when huge crowds mainly consisting of womenfolk and children pay their homage. The goddess cures her devotees of all physical ailments. A charismatic yet considerate form is seen here. Mud replicas of the different parts of the human body are placed in the temple as offering and pleading the mother for cure. This temple was constructed at the place and the idol installed and so the deity of this temple is known as Punnainallur Mariamman. It is said that the daughter of Tulaja Raja (1729-35) of Tanjore, who lost her eyesight in an illness, regained it on offering worship at this temple. In general all fridays are special, in particular the fridays of the tamil month Aadi will be more special. Devotees throng the temple in August/September, the season which relates a lot with this goddess. Sundays are considered to be the most auspicious days for worshipping the Goddess, when huge crowds mainly consisting of womenfolk and children pay their homage. Pechchi Amman is believed to protect children who cry in fear of certain things and is said to have the power to remove those fears in Children, if one offered his/her sincere prayers to the Goddess. Devotees who come here and offer their prayers for one week are said to be liberated from all kinds of health issues if they drink the milk offered during the four poojas that take place every day. In the first half of the 18th Century, King Thulaja is believed to have constructed a small temple with a single prakara for Goddess Ambigai at the place where the pit was located. Between 1798 AD and 1832 AD, King Sarabhoji II constructed the Maha Mandapa, Narthana Mandapa, the tall front temple tower and the 2nd Prakara. Subsequently, a third prakara and the outer walls were constructed. The temple was fully renovated a couple of years back and sports a new fresh look. The main entrance of Punnainallur Mariamman Temple features a recently built Rajagopuram (temple tower) with seven tiers. The Dhwajasthambham (flag pole) and the Balipeedam (platform for food offerings) are in the first praharam (enclosure). This area also contains Naga deities (the snake gods) and a Vasantha Mandapam (hall). 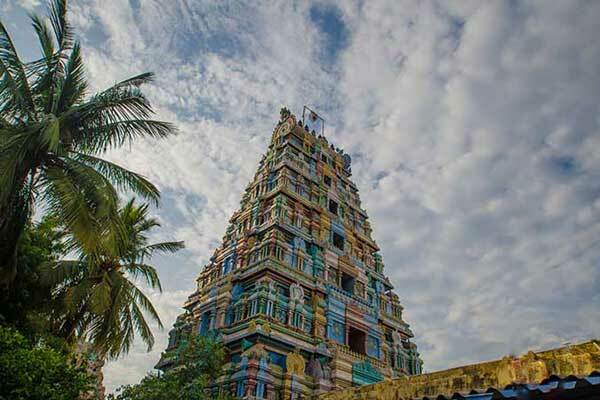 As Punnainallur Mariamman is a self-manifested natural phenomenon, the famous sage, Sadhasiva Brahmendrar, a saint and composer of Carnatic music in Sanskrit and an Advaita philosopher from the 18th century, visited this temple. He installed the sacred symbol called Srichakram and shaped a face of Mariamman over the Puttru (anthill). Therefore, no Abhishekam (ablution) is performed on the image. Instead the goddess’s image is coated with punugu - the oily, perfumed secretion of the civet cat. People pay special fees to see Mariamman adorned in a golden pavadai (long skirt) and blouse. The skirt, that is beautifully pleated and etched as if it were made of fabric, is a truly magnificent piece of adornment. The Abhishekam is performed to the Utsavar Murthy (processional deity), called Vishnu Durgai, near the sanctum. Once in five years Thailabishekam (punugu sattam or application) is performed for 48 days over the Puttru. During this ritual period, devotees can pay respects only to a curtain drawn in front of the goddess with an image of Amman featured on it. During summer, you can see little drops of water—sweat—on the face and forehead of Mariamman. Water is filled in the area around the goddess’s image to reduce the heat in the sanctum. Other deities like Vinayaka (Ganesha the elephant-headed god) and his brother Subrahmanya/ Muruga can be seen in the Punnainallur Mariamman Temple in their own little shrines. An image of Sage Sadhasiva Brahmendrar is also placed inside the main temple. To the left of the sanctum there is a shrine for Peechhi (Pechchi) Amman, a form of Rajarajeshwari (Parvathi) and another village goddess. The goddess cures her devotees of all physical ailments. A charismatic yet considerate form is seen here. Mud replicas of the different parts of the human body are placed in the temple as an offering and pleading the mother for cure. An interesting feature of Mariamman at this temple is that she is seen sweating during the summer months and this is said to disappear on its own after sometime. Hence, she is referred to as Muthu Mariamman. In general all Fridays are special; in particular the Fridays of the Tamil month Aadi will be more special. Devotees throng the temple in August/September, the season which relates a lot with this goddess. Sundays are considered to be the most auspicious days for worshipping the Goddess, when huge crowds mainly consisting of womenfolk and children pay their homage. In the month of ‘Purattasi’ (September-October) the Floating Festival (Theppam) takes place in the holy tank located at the temple. Brahmotsavam takes place in the months of ‘Adi-Avani’ (August). Navarathri, Mahasivarathri are the famous festivals celebrated here. Brahmotsavam: Brahmotsavam, the main festival of the Punnainallur Mariamman is celebrated in Adi (July-August). In this month there is a special procession of Muthu Mariamman in a highly decorated pearl palanquin. The Car/Chariot Festival takes place on the last Sunday of Aavani (August-September). Theppam or Tank Festival: In Purattasi (September-October) the Theppam or Float Festival is performed in the holy tank of the temple. A floating structure carries the image of the goddess and is lit brilliantly with many lamps. As it moves across the waters, it creates a heavenly spectacle. There is no daily Abhishekam for the Goddess Mariamman in this temple. Once in five years, Goddess Mariamman is anointed with a Thailabishekam (oil application continuously for 48 days). During this period, it is believed that her powers increase manifold and she is offered coconut water and curds (yoghurt) to cool her down. Pechchi Amman is believed to protect and remove the fear of children who cry at imaginary things. People suffering from eye problems offer worship to Mariamman. 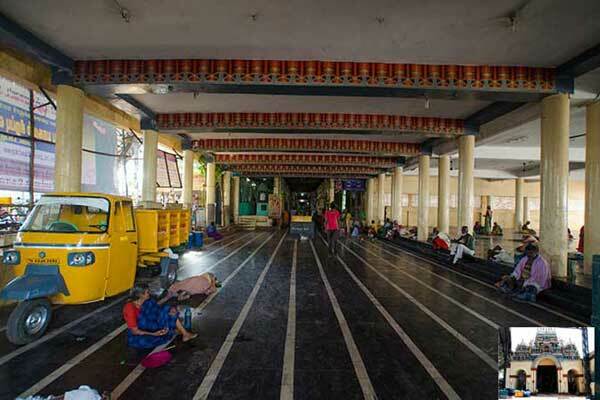 Punnainallur Mariamman Temple is popular with devotees who seek cures for skin problems. They come here to pray for relief from measles, chicken pox and skin sores. Devotees come here and offer their prayers for one week to be healed from all kinds of illnesses. They drink the milk offered during the four poojas performed to the goddess every day. People pay special fees to see Mariamman adorned in a golden pavadai (long skirt) and blouse. This temple located in Punnai Nallur, which is popularly known as Mariamman Kovil, Thanjavur and it is 5 km from Thanjavur Old Bus stand. The nearest airport is at Tiruchirappalli (Trichy), 58-km away. The nearest railway station is at Thanjavur, which is directly connected by rail to Tiruchirappalli, Madurai and Chennai. 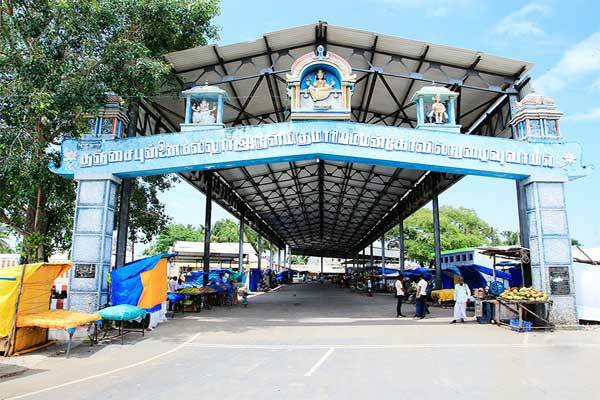 Auto from Railway Station to Mariamman temple will cost Rs. 75-100. There is also a Mariamman koil railway station on the Thanjavur- Thiruvarur Rail route but this is a little far from the temple. Tourists can access Punnainallur by road from Thanjavur, which is just 6 miles away. Regular government bus services are available from Thanjavur. Buses (towards Ammapet/ Nagapattinam) are available for every 15minutes from old bus stand/Railway Station. Also, mini buses ply between old bus stand and Mariamman temple.